These strange caterpillars are one of our native species, called the lackey moth, Malacosoma neustria. Lackey moths are moderately common across the southern half of England and Wales. Groups of larvae can be found between April and June feeding on a variety of trees and shrubs, but are most often encountered on fruit trees and in hedge species, such as native roses, blackthorn and hawthorn. They don't present any human health risk but can cause considerable defoliation of the host plant if present in large numbers. However, even extensively defoliated shrubs usually recover by growing a second flush of leaves, so I don’t see any cause for concern at the moment with your apples. Lackey moth larvae live in colonies for most of their lives. Newly hatched larvae spin a small web between two or three leaves, but these larger larvae have built a more substantial 'nest' by spinning together twigs and branches in a thick web of silk. A large colony may form a nest up to 30cms long and 15cms wide which can be a conspicuous object on the host tree, especially if a lot of the foliage has been eaten. The larvae grow rapidly and by mid-June most will be about 50-55mm long and ready to disperse and find sheltered spots to pupate. The flight period of the adult moths, which are relatively dull brown in colour, is July to August. So fortunately, no cause for alarm here. They can just be left in peace to continue doing their thing. The wet weather has brought some unusual visitors to Watermead. The Snipe in the photo above were spotted by Su and Paul Wilson on the field behind Mallard Close in December 2013. According to the RSPB Complete Book of British Birds, they love flooded grassland where worms have been forced to the surface and where the ground is soft and there's plenty of vegetation to provide camouflage. It's not surprising, then, that they decided to visit since there's been plenty of standing water in that area for several months. 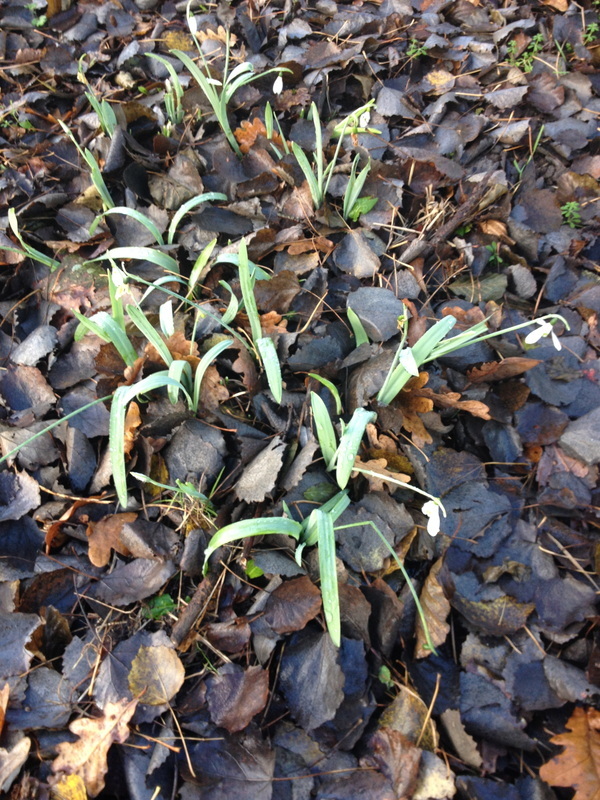 Despite the high water levels the bulbs planted in September are now coming through. 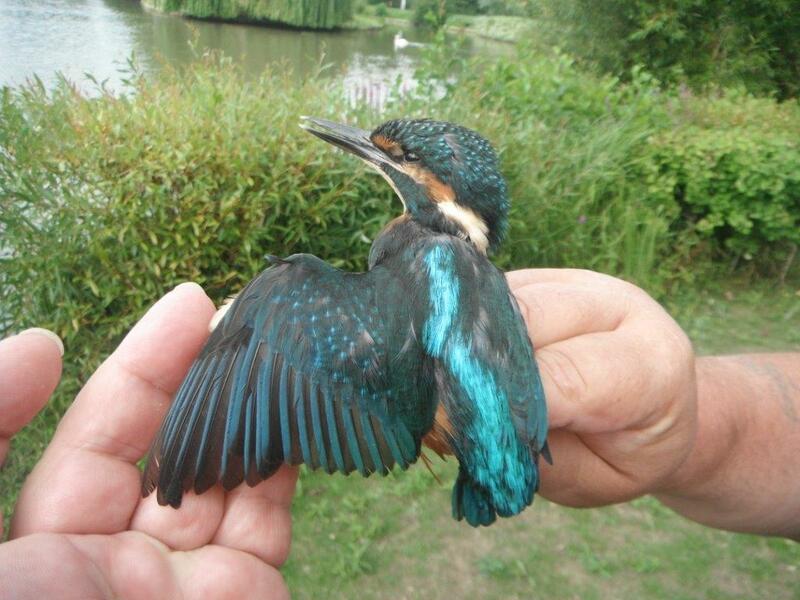 This young Kingfisher was found by the small alike by Dave Short, leader of The Barn Owl Project. Kingfishers are small unmistakeable bright blue and orange birds found by still or slow flowing water such as lakes, canals and rivers in lowland areas. The are vulnerable to hard winters and habitat degradation through pollution or unsympathetic management of watercourses. Occasionally they may visit garden ponds if of a suitable size. They are widespread, especially in central and southern England. Why is the Copse area roped off? Sunday 8th September the rain just about held off for the first planting day in the Watermead Community Garden. From 11am residents, or should I say teams. arrived fully equipped to help replant two Willow trees along the bank edge and also to plant many bulbs so that there will be all year round colour from January; 750 King Alfred Daffodils, 750 English Bluebells and 500 English Wood Snowdrops (very patriotic). Since the initial planting day some residents of Watermead have also very kindly donated some further semi mature shrubs and also some strawberry plants, which have very kindly been planted by Graham Severn. This garden is for everyone of Watermead to enjoy and hopefully we will see this area being used once again by the Wildlife. If you would like to donate any plants or trees please do contact Noreen Shardlow on 01296 641423 or email noreen.shardlow@watermead-pc.gov.uk.